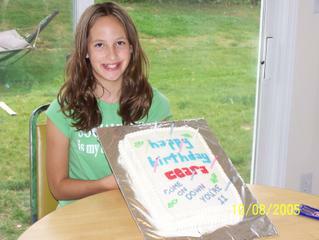 Friday was Ceara's 11th birthday. For her birthday, she invited 2 friends to spend the night, and Allie had one of her friends over, too. We had Ceara, Allie, Maggie, Taylor and Ashley. Jeff planned most of the party, and decided on a "Price is Right" theme because he bought the DVD game for everyone to play. 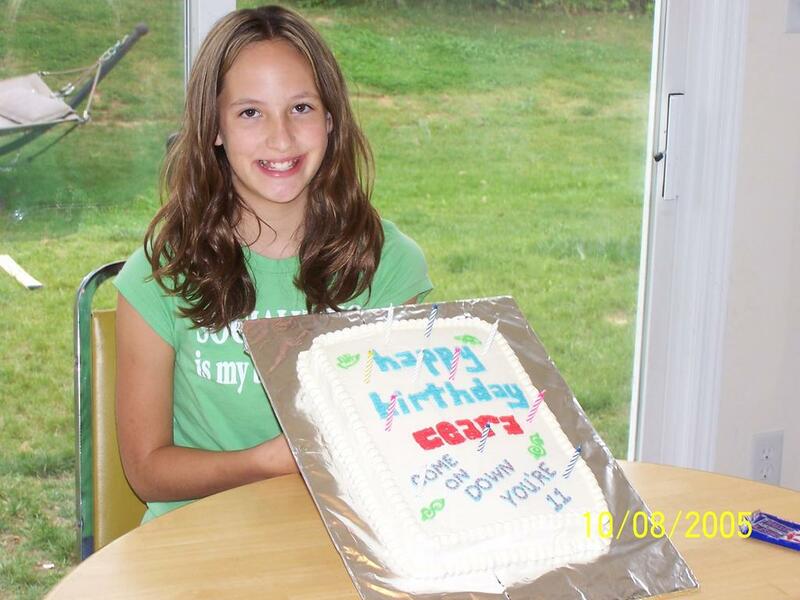 Thus the cake she is pictured with. Anyway, Friday night, we had a game of Trivia for various prizes. Jeff bought a variet of gifts from the store such as a book, fuzzy socks, stickers, pencils, and such. He listed all the prizes on paper, cut them out, and put the paper under 3 cups on a table. To win the prize, they had to answer a trivia question, then they had to pick 1, 2, or 3 and they win the prize under the cup. In addition to real prizes, he put in several "gag" gifts. Like "a pair of smelly socks" - which he took directly off his feel when someone won. And "a wad of toilet paper" - not used of course. Also, a "chew stick" of the dogs. It was very funny when the girls won one of these "prizes". After all the prizes were won, they all played "The Price is Right" on the DVD game while I went off to finish the cake and cupcakes. Everyone was tired, so the game didn't last long. The girls fell off to sleep, one by one. Allie was the first to sleep, then Ashley and Maggie. Jeff and Conor had long ago went to bed, then I finally finished with the cakes and joined them - at about 2am. Ceara and Taylor were still up playing "I spy". The next morning, Jeff and I got up around 7 or 7:30 to fix breakfast, and the girls were already awake. All but Allie, that is. We had bacon, sausage, waffles, muffins (blueberry and strawberry), eggs, hash rounds (Crispy Crowns) and strawberries. Needless to say, there was a ton of food to be eaten. Later that day, at around 1PM, we had Ceara's Nana and Grand-Dad over for presents, lunch, cake and ice cream. Nana brought with her a bunch of balloons, which Conor immediately claimed as his own! :) The kids spent most of the rest of the day outside playing. They finally went home around 5:30, at which point Ceara wanted to go shopping to spend her birthday money. We took her to Walmart so that she could buy herself the new Nintendo DX. We then took Allie and Ceara to my mom's to spend the night. Happy Happy Birthday, Miss Beautiful!! I hope you had just the best time ever!